Club’s favorite lake and why? Smith Mountain Lake, Striper! 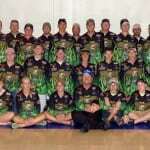 Describe TBF tournaments, community service and/or conservation projects your club has or plans to have? 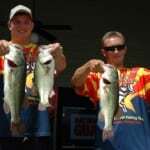 Plan to volunteer at the major fishing tournament in any capacity needed. Has your club done any fundraising? Not yet! Where do you get your volunteer boaters from? (parents, local bass club, etc.) As of now, we are looking for people, but feel parents and local bass clubs may help. Tell us something unique about your club! Just starting out. Still finding our way to uniqueness! 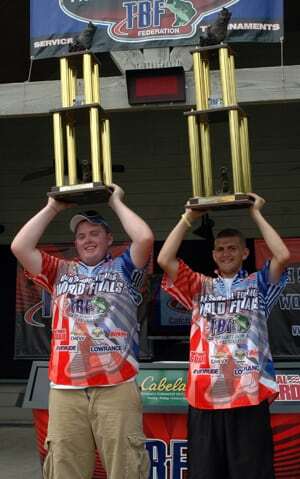 July 24, 2010 – Raymer and Snyder, from Meade County High School sealed the deal today with a sweet victory on the finale of the inaugural 2010 High School Fishing World Finals on lake. Both walked away with $4,000/yr up to four year scholarships totaling $16,000 a piece/$32,000 from Bethel University, spots on the Bethel University Varsity Fishing team, $500 Cabelas gift cards, new Compaq laptops, a Berkley Prize Package including a Revo Reel and 30% Pure Fishing on the TBF website, plus some heavy jewelry. The weights were zeroed for the final day of competition, making the playing field level and the weigh-in intense. Raymer and Synder were the last to the stage. With only the team from North Canyon High School in their way, the Meade County team excited the crowd and themselves as the scale read 16lbs 2ounces, pulling them ahead by 2lbs to win it. The winning team was not the only team who won big; the remaining top six teams did not leave home empty-handed. The second place finishers, Thomas Chambers and Brandon Koon of North Canyon High School, caught five fish weighing 14lbs 8ounces and were awarded trophies, $300 Cabelas gift cards, mini laptops and a Berkley Package including a Revo Reel and 30% Pure Fishing on TBF web. The third place team was, Sawyer Grace and Austen Cathcart of Russellville High School. They caught five fish weighing 12lbs 3ounces and received trophies, $200 Cabela’s gift cards, Flat Screen HD TVs and a Berkley Package including a Revo Reel and 30% of Pure Fishing on TBF web. 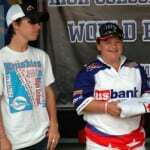 In fourth, the team from Dover High School, Austin Moody and Aimee Cresswell with four fish weighing 10lbs 14ounces. 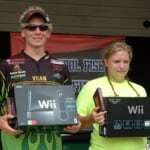 They received $200 Cabela’s gift cards, two Sony WII’s and Berkley’s Prize Package. 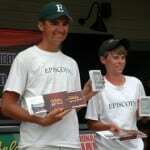 In fifth, Jonny Schultz and Thomas Rose, Jr. from Episcopal Collegiate High School had three fish weighing 8lbs 5ounces. 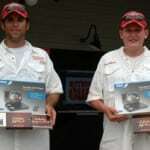 They received $150 Cabela’s gift cards two IPOD touches and the Berkley Prize Package. Sam Starr and Brady Sherman from McPherson High School came in sixth and received $100 Cabela’s gift cards, two portable DVD Players and the Berkley Prize Package. In seventh, respectively is the team from Farragut High School who received $50 Cabela’s gift cards, two IPOD Shuffles and the Berkley Prize Package. This week was not only about fishing, but also education and why it’s important for the future. In turn, four specific awards were handed out to highlight just that. In addition, two awards were all about who traveled the farthest and which team brought the most school spirit with them. First, the Conservation Award, sponsored by Rideout Lumber, looked for the team who took care of their catch the best. This was awarded to Jenna Beam and James Maywald from Ponca City High School. 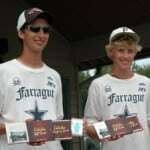 Next, the Boater Safety Award, sponsored by Arkansas Game and Fish, was unanimously given to Jordan Burdette and Brandon Merical from Farragut High School. The Marketing Award, sponsored by Ranger Boats, was awarded to the Dover High School team for their tremendous efforts promoting their team and the sport of high school fishing. They received a $250 Ranger Clothing Voucher. Another award was the Sportsmanship Award, sponsored by Wilkins Brothers, which hands down went to the team from Pottsville High School, Hunter Daniel and Corey Mckown. 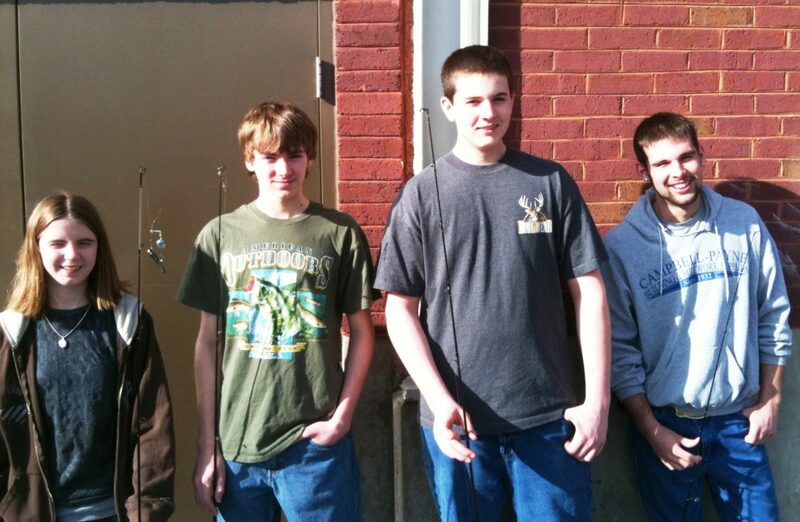 These anglers let a team from Dover High School have their water because they knew they had a shot at the top seven; they received brand new rods and glasses. The anglers who traveled the farthest received the Going the Distance Award and $100 gas card. 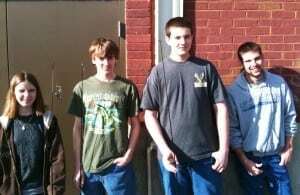 Traveling 1224 miles was the winning team from North Canton High School in Phoenix, Ariz, Brandon Koon and Thomas Chambers. Last but not least, was the School Spirit Award, sponsored by Cogswell Motors. Baylee Jo Linker and Haley McGuire from Pottsville High School received this award and $100 Wilkins Brothers gift card. Additional prize winners were one lucky member of the crowd who took home a $1,000 Cabela’s gift card by entering his name in a drawing we advertised all week and a TBF high school fishing member who won a Sony Wii for winning a dance/surfboard competition we had at the Friday night Celebration Party. 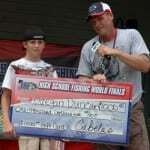 There were so many opportunities to win prizes and several of the high school anglers went home with tons of merchandise, and hopefully a week they will remember for the rest of their lives. For final results, click here. 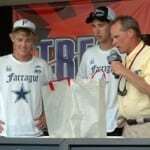 July 23, 2010 – Changes on Lake Dardanelle slowed the bite, but not for some who rose above the pack to solidify their spots on the final day of competition. These top seven teams advance to battle it out to see who will become the first High School Fishing World Finals Champions. Tomorrow will decide who goes home with the titles and a prize package never seen in the industry. 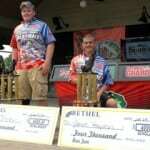 Champions will receive $32,000 in scholarships-$4,000/yr per winning angler up to four years-from Bethel University, spots on the Bethel University Collegiate Bass Fishing team, which is treated like any other college varsity sport team, thousands in prizes, including $500 Cabelas gift cards, and so much more. 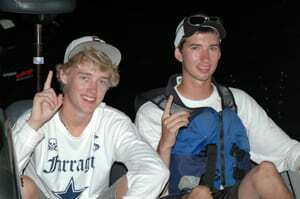 History is about to be made, and two high school anglers future’s changed forever. Perseverance is the key for the North Canyon High School team, of Thomas Chambers and Brandon Koon. They caught five fish today weighing a whopping 15lb 9ounces compared to their 4lb 12ounce catch on day one, making their total 20lb 5ounces. Chambers and Koon prove it’s never too late to give up. Tomorrow, everybody’s weights are zeroed; every team and every ounce starts again, as the top seven teams face each other and Dardanelle to see who can come from zero to everything and win it all.